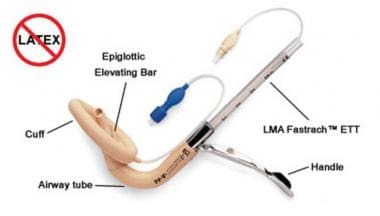 The LMA is shaped like a large endotracheal tube on the proximal end that connects to an elliptical mask on the distal end. It is designed to sit in the patient’s hypopharynx and cover the supraglottic structures, thereby allowing relative isolation of the trachea. The patient should be obtunded and unresponsive before one of these devices is placed. The LMA is a good airway device in many settings, including the operating room, the emergency department, and out-of-hospital care, because it is easy to use and quick to place, even for the inexperienced provider. [4, 5, 6] A success rate for placement of a LMA of nearly 100% occurs in the operating room. A lower rate of achievement for LMA placement may be expected in the emergency setting. Its use results in less gastric distention than with bag-valve-mask ventilation, which reduces but does not eliminate the risk of aspiration. [8, 9] This may be particularly pertinent in patients who have not fasted before being ventilated. The LMA Classic is the original reusable design. The LMA Fastrach, an intubating LMA (ILMA), is designed to serve as a conduit for intubation. Although most LMA designs can serve this purpose, the LMA Fastrach has special features that increase the rate of successful intubation and do not limit the size of the endotracheal tube (ETT). These features include an insertion handle, a rigid shaft with anatomical curvature, and an epiglottic elevating bar designed to lift the epiglottis as the ETT passes. The LMA Flexible has softer tubing. It is not used the in the emergency setting. The LMA ProSeal has the addition of a channel for the suctioning of gastric contents. It also allows for 50% higher pressures without a leak. However, it does not permit blind intubation and is not currently used in the emergency setting. Another newer design is the LMA CTrach, which inserts like the LMA Fastrach and has built-in fiberoptics with a video screen that affords a direct view of the larynx. The LMA can be used as a conduit for intubation, particularly when direct laryngoscopy is unsuccessful. The LMA is useful in the prehospital setting not only for patients in cardiac arrest but also for managing a difficult airway. Laryngeal mask airways are available in a range of pediatric sizes. 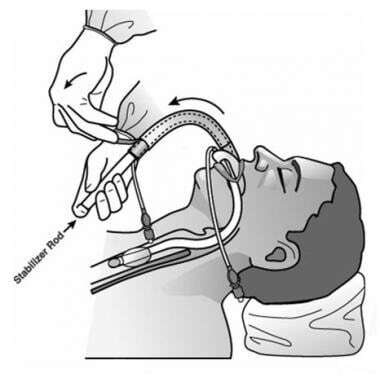 Laryngeal mask airway (LMA) insertion is facilitated by sedation. Propofol (Diprivan) or midazolam (Versed) are acceptable choices. For elective ventilation in the operating room, less anesthesia is typically required for insertion and maintenance of the LMA than for endotracheal intubation. In the emergency setting, the patient is often obtunded or unconscious, and further sedation may not be necessary for LMA insertion. The risk of inadequate sedation is triggering laryngospasm. For more information, see Procedural Sedation. Paralysis is not necessary for LMA insertion and maintenance. Movement and coughing upon insertion should be particularly avoided in patients who are at risk for cervical spine injuries; therefore, adequate anesthesia is particularly important in these patients. Children may require deeper anesthesia. LMA Classic. Image courtesy of LMA North America. LMA Fastrach. Image courtesy of LMA North America. Preoxygenate the patient with 100% oxygen via a nonrebreather mask, as time allows. Choose the appropriate size of laryngeal mask airway (LMA). Check the LMA cuff for leaks. Deflate the cuff of the LMA completely against a flat surface. Apply a water-soluble lubricant generously to the posterior surface of the mask. Decreased rates of successful insertion have been seen with application of cricoid pressure. 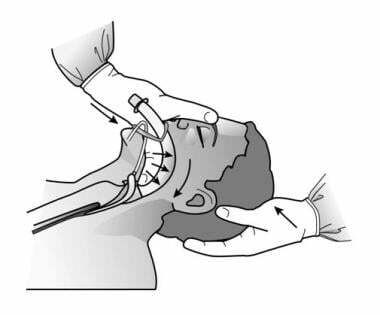 [4, 5, 6] Therefore, if cricoid pressure is applied, it may need to be released in order to properly position the LMA or intubate through the intubating laryngeal mask airway (ILMA). Hold the LMA like a pen, with the index finger of the dominant hand at the junction of the mask and the tube, as shown below. Slide the LMA along the hard palate, pushing it back against the palate as it is advanced toward the hypopharynx, as in the image below. This prevents the tip from folding over on itself and reduces interference from the tongue. Advance with gentle pressure until resistance is met. If necessary, continue pressure on the tube with the nondominant hand to fully advance the LMA to its proper position. Once in place, inflate the cuff without holding the LMA to allow it to acquire its natural position. Approximately 8 cm of the tube protrudes from the patient’s mouth. The video below depicts LMA insertion. Video demonstration, insertion of the LMA. Hold the ILMA by the handle. 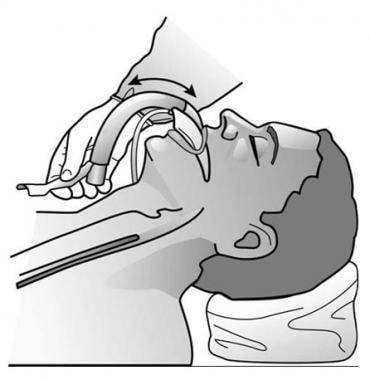 Insert the mask into the patient’s mouth and push it back against the hard palate, as shown below. Slide the mask backward, following the curve of the tube. Swing the ILMA into place. Inflate the cuff as with the LMA. Insert this model like the original LMA or attach it to a rigid insertion handle and insert it like an ILMA. An alternate method is to use a bougie by placing it into the drainage tube and passing it deliberately into the esophagus under direct laryngoscopy. Advance the ProSeal over the bougie into position. Confirm the position of the LMA by auscultating bilateral breath sounds and an absence of sounds over the epigastrium, observing chest rise with ventilation, and placing an ET CO2 to look for color change. Ensure that the vertical black line on the tube is at the patient’s midline. Assess for ability to generate up to 20 cm of water pressure without a leak. 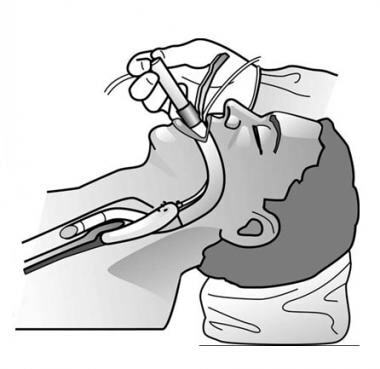 The LMA Classic and LMA Unique limit the size of the endotracheal tube (ETT) that can be passed. A 6.0 ETT fits through LMA sizes 3 and 4. LMA sizes 5 and 6 accommodate an ETT up to 7.0. Inspect the ETT and lubricate it well. Pass it through the lumen of the LMA tube into the trachea until intubation is complete. Confirm placement, as shown below. A bougie or fiberoptic scope may be used to assist intubation. The ETT is included with the LMA Fastrach, but a standard ETT can also be used. Once the patient is intubated, the ILMA can be removed by deflating the cuff and passing it over the tube using a stabilizer rod, as shown. Removing the ILMA after intubation. To optimize proper positioning, make sure the mask is completely deflated, with a smooth, well-lubricated surface. Placing the mask face down on a flat surface such as a table helps achieve proper deflation. If insertion is unsuccessful with cricoid pressure, release pressure and reattempt insertion. If the initial laryngeal mask airway (LMA) placed does not result in a good seal, attempt the next larger size. In general, if a patient is between sizes, choose the larger size. 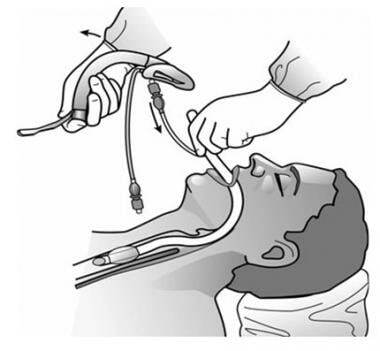 When intubating through the ILMA, advance the endotracheal tube (ETT) until it is about to emerge from the LMA (near the 15-cm mark). 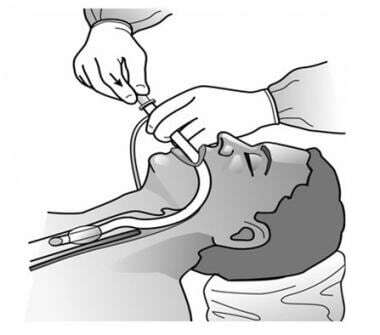 Then, lift up on the handle as the ETT is advanced into the trachea to complete intubation. This is known as the Verghese maneuver after Dr. Chandy Verghese. 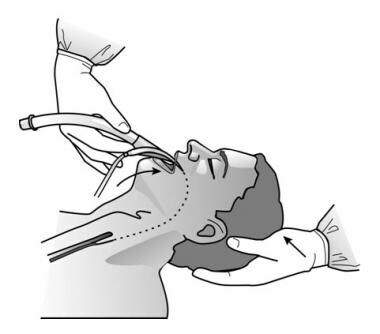 Although the LMA can be left in place after intubation, removing it promptly helps minimize upper airway trauma. A table showing laryngeal mask airway size based on patient weight is included below. What is a laryngeal mask airway (LMA)? What are the different types of laryngeal mask airway (LMA)? When is elective ventilation indicated with a laryngeal mask airway (LMA)? When is the use of a laryngeal mask airway (LMA) indicated as a rescue devise? What are the AHA guidelines for use of a laryngeal mask airway (LMA) during cardiac arrest? When is a laryngeal mask airway (LMA) used as a conduit for intubation? How is a laryngeal mask airway (LMA) used in prehospital airway management? Is laryngeal mask airway (LMA) indicated for use in pediatric patients? What are absolute contraindications for use of laryngeal mask airway (LMA)? What are relative contraindications for use of laryngeal mask airway (LMA)? 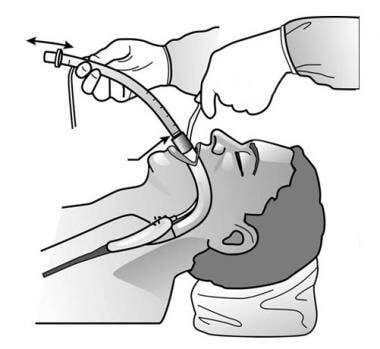 What is the role of anesthesia during the insertion of a laryngeal mask airway (LMA)? What equipment is needed for insertion of a laryngeal mask airway (LMA)? What is the optimal head position for insertion of the laryngeal mask airway (LMA)? How are patients prepared for laryngeal mask airway (LMA) insertion? What is the role of cricoid pressure in the insertion of a laryngeal mask airway (LMA)? How is a laryngeal mask airway (LMA) inserted? How is an intubating laryngeal mask airway (ILMA) inserted? 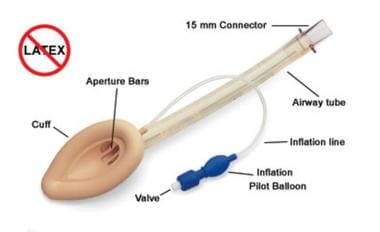 What are the techniques used for insertion of the ProSeal laryngeal mask airway (LMA)? How is placement of the laryngeal mask airway (LMA) confirmed? How is intubation performed following insertion of a laryngeal mask airway (LMA) or intubating laryngeal mask airway (ILMA)? What are clinical pearls for insertion of laryngeal mask airway (LMA)? What are potential complications of laryngeal mask airway (LMA) insertion? What are the sizes of laryngeal mask airways (LMAs)? Miller RD. Miller's Anesthesia. 6th ed. Philadelphia, Pa: Elsevier Churchill Livingstone; 2005. 1625-28. Roberts KD, Brown R, Lampland AL, Leone TA, Rudser KD, Finer NN, et al. Laryngeal Mask Airway for Surfactant Administration in Neonates: A Randomized, Controlled Trial. J Pediatr. 2017 Nov 21. [Medline]. Fan CH, Peng B, Zhang FC. Influence of laryngeal mask airway (LMA) insertion anesthesia on cognitive function after microsurgery in pediatric neurosurgery. Eur Rev Med Pharmacol Sci. 2017 Oct. 21 (4 Suppl):37-42. [Medline]. Berry AM, Brimacombe JR, Verghese C. The laryngeal mask airway in emergency medicine, neonatal resuscitation, and intensive care medicine. Int Anesthesiol Clin. 1998 Spring. 36(2):91-109. [Medline]. Pollack CV Jr. The laryngeal mask airway: a comprehensive review for the Emergency Physician. J Emerg Med. 2001 Jan. 20(1):53-66. [Medline]. Levitan RM. The Airway Cam Guide to Intubation and Practical Emergency Airway Management. Wayne, Pa: Airway Cam Technologies, Inc; 2004. 56-69. Walls RM. Manual of Emergency Airway Management. Philadelphia, Pa: Lippincott Williams and Williams; 2004. 97-109. ECC Committee; Subcommittees and Task Forces of the American Heart Association. 2005 American Heart Association Guidelines for Cardiopulmonary Resuscitation and Emergency Cardiovascular Care. Circulation. 2005 Dec 13. 112(24 Suppl):IV1-203. [Medline]. Stone BJ, Chantler PJ, Baskett PJ. The incidence of regurgitation during cardiopulmonary resuscitation: a comparison between the bag valve mask and laryngeal mask airway. Resuscitation. 1998 Jul. 38(1):3-6. [Medline]. Jagannathan N, Sohn LE, Sawardekar A, Chang E, Langen KE, Anderson K. A randomised trial comparing the laryngeal mask airway Supreme(™) with the laryngeal mask airway Unique(™) in children*. Anaesthesia. 2011 Nov 9. [Medline]. DE Rosa S, Ferrari F, Carboni Checcacci S, Rigobello A, Gennaro P, DE Luca D, et al. Airway management with fastrach laryngeal mask versus spritztube: a prospective randomised manikin-based study. Minerva Anestesiol. 2017 Oct 4. [Medline]. Shavit I. Laryngeal mask airway as a rescue device for failed endotracheal intubation during scene-to-hospital air transport of combat casualties. Eur J Emerg Med. 2019 Feb. 26 (1):73-74. [Medline]. Kendall MC. Laryngeal mask airway as a rescue device for failed endotracheal intubation. Eur J Emerg Med. 2019 Feb. 26 (1):73. [Medline]. Fiala A, Lederer W, Neumayr A, Egger T, Neururer S, Toferer E, et al. EMT-led laryngeal tube vs. face-mask ventilation during cardiopulmonary resuscitation - a multicenter prospective randomized trial. Scand J Trauma Resusc Emerg Med. 2017 Oct 26. 25 (1):104. [Medline]. Shin SD, Ahn KO, Song KJ, Park CB, Lee EJ. Out-of-hospital airway management and cardiac arrest outcomes: A propensity score matched analysis. Resuscitation. 2011 Nov 18. [Medline]. Lemaitre EL, Tritsch L, Noll E, Diemunsch P, Meyer N. Effectiveness of Intubating Laryngeal Mask Airway in managing out-of-hospital cardiac arrest by non-physicians. Resuscitation. 2018 Dec 17. [Medline]. Modir H, Moshiri E, Malekianzadeh B, Noori G, Mohammadbeigi A. Endotracheal intubation in patients with difficult airway: using laryngeal mask airway with bougie versus video laryngoscopy. Med Gas Res. 2017 Jul-Sep. 7 (3):150-155. [Medline]. Tanabe S, Ogawa T, Akahane M, Koike S, Horiguchi H, Yasunaga H, et al. Comparison of Neurological Outcome between Tracheal Intubation and Supraglottic Airway Device Insertion of Out-of-hospital Cardiac Arrest Patients: A Nationwide, Population-based, Observational Study. J Emerg Med. 2012 Apr 26. [Medline]. Ellis DY, Harris T, Zideman D. Cricoid pressure in emergency department rapid sequence tracheal intubations: a risk-benefit analysis. Ann Emerg Med. 2007 Dec. 50 (6):653-65. [Medline]. Harris T, Ellis DY, Foster L, Lockey D. Cricoid pressure and laryngeal manipulation in 402 pre-hospital emergency anaesthetics: essential safety measure or a hindrance to rapid safe intubation?. Resuscitation. 2010 Jul. 81 (7):810-6. [Medline]. Choo CY, Koay CK, Yoong CS. A randomised controlled trial comparing two insertion techniques for the Laryngeal Mask Airway Flexible™ in patients undergoing dental surgery. Anaesthesia. 2012 Sep. 67(9):986-90. [Medline]. Verghese C, Brimacombe JR. Survey of laryngeal mask airway usage in 11,910 patients: safety and efficacy for conventional and nonconventional usage. Anesth Analg. 1996 Jan. 82(1):129-33. [Medline]. Jeon YS, Choi JW, Jung HS, Kim YS, Kim DW, Kim JH, et al. Effect of continuous cuff pressure regulator in general anaesthesia with laryngeal mask airway. J Int Med Res. 2011. 39(5):1900-7. [Medline]. Kovacs G, Law JA. Airway Management in Emergencies. New York: McGraw-Hill; 2008. 93-103. Media files are courtesy of LMA North America, Inc., San Diego, Calif.